If you are looking for dog stud tail home remedies most likely your dog’s tail is not in top condition. Stud tail in dogs, medically referred to as tail gland hyperplasia or tail gland infection is not a very common condition. Not all dogs are prone to this, but some dogs may sometimes develop hair loss and swelling of the supracaudal gland. While some dogs may need a course of antibiotics in severe cases, sometimes a mild case of dog stud tail can be treated at home using over-the-counter products. This article will provide a remedy for stud tails in dogs. The dog’s tail has a sebaceous gland that’s located on the top of the tail, right above the dog’s 9th caudal vertebrae. Its presence is associated with coarse hairs. The exact function of this gland is not well known, but there are chances that it’s meant for social purposes. In some dogs, this gland is more active than in others (it’s often seen in intact male dogs), which can sometimes lead to problems. Despite the name “stud” tail, referring to male dogs, female dogs may also be occasionally prone to inflammation and infection of this gland. Tail gland hyperplasia, also known as stud tail, is the inflammation or infection of the supracaudal gland, which is a modified sebaceous gland that secretes sebum, an oily substance. When a dog’s supracaudal gland gets inflamed or infected, the area may look swollen, hence the term “hyperplasia,” and the dog may lose hairs in the area. The hairs by the tail gland may emit an unpleasant smell and may also appear greasy. It’s important to obtain a proper diagnosis by a vet before assuming a dog may have stud tail. Sometimes tumors may develop in the area and hypothyroidism may cause a secondary skin disorder affecting the area. 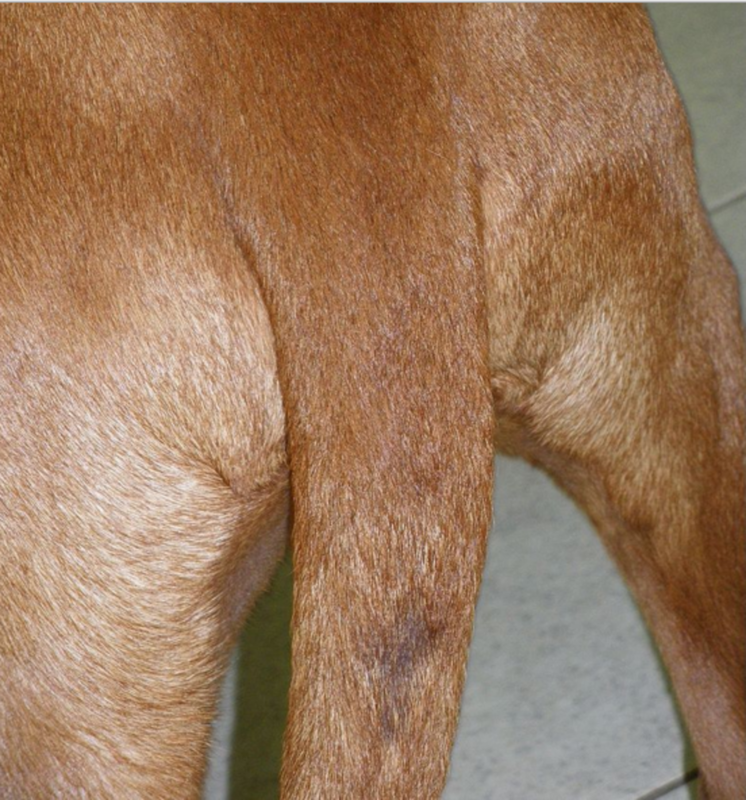 Severe cases of stud tail in dogs may require oral antibiotics such as doxycycline or tetracycline, but milder cases may respond to topical treatment. A potentially effective remedy is to use a medicated shampoo with benzoyl peroxide such as Benzoyl-plus shampoo. Use the shampoo to wash the area twice a day, suggests CriticalCareVet, a board-certified veterinarian specializing in emergency and critical care. Repeated tail gland infections may be due to hormones as testosterone seems to play a role. Some vets may suggest neutering the dog to reduce the instances of stud tail in intact male dogs. According to veterinarian Dr. Michael Salkin, improvement from stud tail should be seen within 2 months of the operation.